Thirsty Pilgrim: More Beery News You Can Use. More Beery News You Can Use. Just some morsels for you today. Mere scraps. You'll take them and you'll like them. Beer historian and enthusiast Ron Pattinson, whom you may know from such European beer guides as the European Beer Guide, has something useful for you. If you visit Amsterdam. His Amsterdam pub guide is available here in PDF or paperback form. I just ordered the paper one. I don't like to take my laptop in to the john. Also, you should hunt down and spend money on the latest issue of Beers of the World magazine for my article on beer-hunting in Lisbon. Now if we could only get them to update the website (but anyway you can't take that into the john either). The article is a feel-good story about making the best of a beer-poor situation. Nice photos too, I think. Speaking of photos, I've entered a few in another contest. This one is at DRAFTmag.com. Vote for me. And other people. So far there aren't many people rating the photos. You can do so here. Prizes include a gift certificate to Flying Dog's online store, which sells such treats as Flying Dog socks and Flying Dog condoms. So there's some incentive for you to enter. Here's a review of my mistress Saison Dupont, from the Oredigger newspaper at the Colorado School of Mines. Of all places. Just in case you wanted an example of how deeply serious Belgian beer has penetrated the American scene these days. Now. Eleven days to ZBF. Have you been poring over the list, making plans to try all the new ones in proper order? Or just looking for the ones you like and preparing to settle in with those all day long? 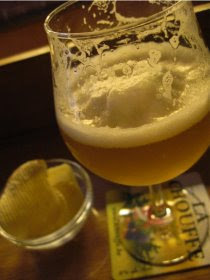 Pictured here is a refreshing, bright and floral Saison Cazeau, enjoyed at Bier Circus in Brussels. It's in the DRAFT contest too. Very much enjoyed the article about Lisbon - my brother is building a house not too far from the city and I will be passing on the drinking information to him. Glad you liked it! Maybe your brother will be the first one to open a real craft brewery in Portugal. Have you visited there yet? Still waiting for your "Imperial Mild" recipe. I'll get my brother to brew it for me. Ron, will you be at ZBF this year? I reckon St. Bernardus 12 will be there. Unfortunately, I've no idea if I'll make ZBF this year. I could be in the US on business. IF not, I'll definitely be there on the Saturday. I haven't been yet - and I am not entirely sure when my borther will be moving down there from England. Unfortunately while he will dirnk beer he is much more of a wine drinker. Tempting to see if he could be persuaded to open a brewpub though! Belgium's New Wave of American-Hoppy Beers. It's Never the Beer's Fault. Of Beer Fests and Mutually Supportive Geekery. A Cosmic De Dolle Debut, and Other News.